"Latinization and the Latino Leader, by Marlene Gonzalez and Cristina Benitez "
With the growth among the Hispanic population of consumers as well as Hispanics in the workforce, American companies need to evaluate how well they are integrating Latinos into management positions. Latinization and the Latino Leader provides expert data and counsel on why it is important to a company's bottom line to develop their Latino workforce and prepare them for management positions. The book discusses the cultural differences that may keep Latinos from pursuing management positions as well as the stereotypes that may be emanating from the corporate culture to discourage Latino employees. Sets the stage for the increased Latino influences in the United States. It discusses the diversity of Latinos and provides Latino cultural themes and values to help organizations understand their Latino leaders. Provides the most recent statistical data and projections for the U.S. Latino population. It also provides information on Latinos’ financial impact and how it is changing. This chapter explores the Latino consumer and takes a close look at segmentation providing organizations a richer understanding of how to connect with this diverse target market. Examines the present and projected impact of the U.S. Latino labor force, defines the most common challenges emerging Latino leaders face in the workplace, and offers valuable insights from The Emerging Latino Leader Attitudes and Behaviors in the Workplace© study. This original study included 100 Latino leaders in mid- to senior-level positions. The study looked at “the Latino professional,” personality traits, preferred leadership style, and how the Latino cultural context influences factors such as leadership success, derailments, and competence. Investigates Latino employees’ representation at major corporations and gives organizations tangible solutions to successfully develop, retain, and advance Latino leaders. Explores the existing barriers to Latino advancement, such as bias, stereotyping, and corporate politics. It tackles the glass ceiling and looks at diversity and inclusion. This chapter addresses ways to help Latino employees take responsibility and direct their careers. Introduces the Latino competency model, developed by the authors especially for this work. It is a unique view of the archetypes that influence Latino cultural values and the key competencies these values bring to organizations. Introduces concrete ways to expand Latino employees’ networking capabilities, discusses the platforms organizations can use to enhance their networking infrastructure, and details a mentoring strategy program designed to connect emerging leaders with senior executives. Creates “MyBrand,” an innovative approach to helping employees assess their individual strengths, weaknesses, and talents. In a world bombarded by information, choices, and competition, it is important to define one’s personal “brand” to confidently promote oneself throughout the organization and community. 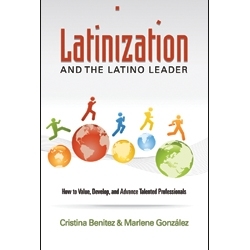 Examines the growth, vitality and future of Latinas as leaders. Three outstanding Latina leaders share their stories of how they rose to the top of their professions and provide concrete examples of what it took. This chapter delves deeper into the proprietary study. The authors conducted further investigation by partnering with the National Hispana Leadership Institute in a new proprietary study, Latinas as Corporate Leaders, that surveyed 250 Latina professionals to help organizations understand and better use their Latino talent. The book is fully indexed and contains selected resources that will guide the reader toward additional sources as needed.